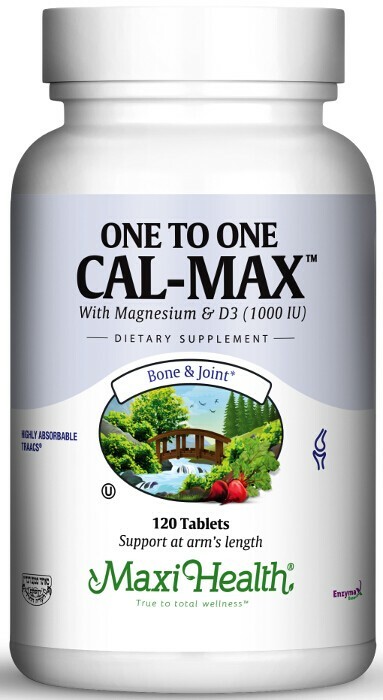 Have you been looking for a calcium based supplement that has an equal amount of magnesium and a generous helping of vitamin D3 One to One Cal-Max™ should be the tablets you take. One to One Cal Max™ uses vitamin D3 (as cholecalciferol) which is the same thing you would get from sitting out in the sun. It’s the most usable form for your body. For many people adequate sunshine is no longer an option. With the busy indoor schedules, requirements of religious dress, and vulnerability to skin problems, supplementation is fast becoming the method of choice for adequate vitamin D intake worldwide. Get One to One Cal Max™. Take two (2) tables, once or twice daily with meals, or as directed. Other Ingredients: Dicalcium phosphate, stearic acid, croscarmellose sodium, magnesium stearate, microcrystalline cellulose, Enzymax® (calcium carbonate, bromelain, papain, lipase, amylase, protease, silica), aqueous film coating, and titanium dioxide. TRAACS® is a registered trademark of Albion Laboratories, Inc. Enzymax®, a vital digestive enzyme complex, is a registered trademark of Maxi Health Research® LLC. I'm a young woman with Crohn's disease. I was diagnosed at age 21. Part of health program is to take supplements. My experience has been that your products work the best. I take One to One Cal Max, Relax to the Max, your fish oil, multi and vitamin D3, magnesium and your probiotics. Thank you for your great products.